47. Offer peanut butter and nuts. Peanut butter is nutritious and has a high energy content, so it is often a component of bluebird mixes. The easiest way to offer it is smeared into the crevices of tree bark or stuffed into the holes of hanging log feeders. It’s fun to hang old pinecones stuffed with peanut butter on tree branches—this is a favorite feeder type for chickadees and a delightful project for small children. In his book A Complete Guide to Bird Feeding, John V. Dennis reports cases of birds choking on peanut butter. Because of its sticky texture, it can gum up their mouths, so mix peanut butter with a generous amount of cornmeal to make it grittier. In summer, peanut butter may get too goopy to use even with cornmeal, but during northern Minnesota winters, I offer unadulterated peanut butter—when frozen, birds have no problem with it. 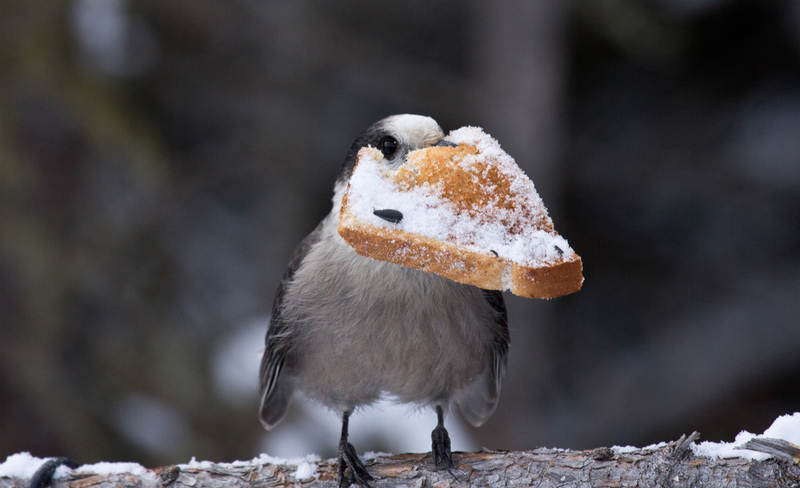 Birds don’t seem to have a preference between chunky and creamy. Because peanut butter is produced for human consumption, it is screened for aflatoxins and other contaminants and is safe for birds. Peanuts in the shell are popular with jays and even much smaller birds. In my own yard, chickadees frequently carry off small peanuts in the shell to eat on a branch. 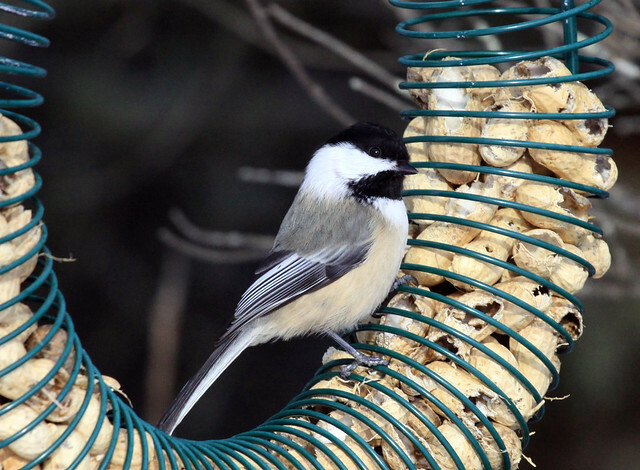 Once I watched a chickadee pick up a huge peanut—one with three kernels, which probably weighed a full third of the chickadee’s weight. The tiny bird took off, steadily losing altitude and barely making it into a nearby lilac bush. There it spent the next hour chipping away and eating while its flock came and went several times. Peanut kernels, hearts, and chips are also popular with jays and a huge variety of other birds. Unfortunately, like corn, peanuts sold for animal consumption may be contaminated with aflatoxins, especially when sold in plastic bags or improperly stored. Until all peanut producers are required to screen peanuts sold for bird feeding for aflatoxins, we consumers should refuse to buy peanuts that might kill the birds we are trying to feed. Peanuts sold in grocery stores for human consumption have been screened and are safe for birds. Peanut hearts and kernels are often offered in mesh cages. Make sure the mesh is wide enough to allow the birds easy access to the seeds, and avoid painted ones—paint chips can be ingested. I provide peanut hearts in a small acrylic feeder affixed with suction cups to a second-story window, which squirrels can’t reach. Unless your birds go through peanuts very quickly, small feeders that are freshened frequently are better than large ones. Bring peanuts in during rainy spells. Peanut chips are often mixed with niger thistle for finches. Make sure these mixtures stay fresh. Mixed nuts (cracked so that birds can get at the meat) and acorns are popular with a variety of birds. Make sure that the nuts don’t get wet. 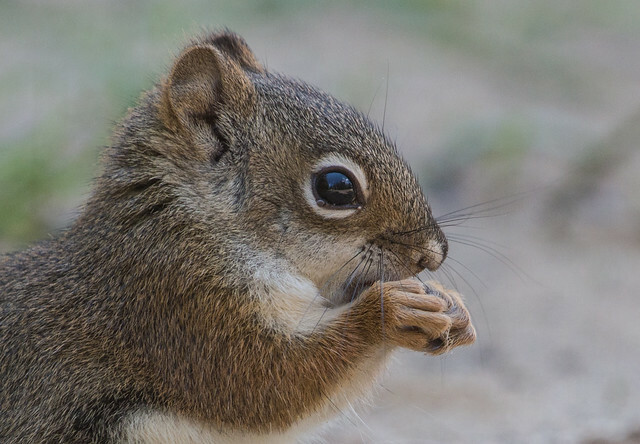 Since squirrels and chipmunks love nuts as much as birds do, but feeders designed or placed to exclude them. Otherwise, plan on spending an inordinate amount of time and effort trying to keep squirrels at bay, or learn to enjoy them.